Within the Australian Defence Force (ADF) Commando personnel are considered Special Forces (SF) in contrast to the United Kingdom who considers their Commandos (both Royal Marines Commandos and All Arms Commandos) as elite forces. Australian Commandos, part of the Australian Army’s Special Operations Command (SOCOMD), are highly skilled soldiers who are trained and qualified in a range of advanced specialist weapons and equipment and can deploy to their area of operations over long distances using a wide range of insertion methods. Commandos can operate in a variety of demanding operational situations in any region of the world where Australia’s national interests are served. In recent times, Commandos have deployed to a wide range of locations including East Timor, Iraq, Afghanistan and the Solomon Islands. Commandos work hard and for long hours, therefore they must be mentally tough, able to cope with extended irregular hours and have a demonstrated ability to balance their professional and personal responsibilities. As a Commando individuals will be expected to undertake new tasks quickly, respond effectively to challenges and to adapt to different environments. This includes the ability to operate effectively and without signs of undue stress, panic or excessive fear when exposed to heights, in dark confined spaces, in the ocean or in a surf zone at any time, either alone or as part of a team. Stage 5: Commando Initial Employment Training (11-months). This article is divided into five sections for easier reading, starting with Section One which provides a background to Commando forces, aim of Commando training and gender. Section Two looks at entry standards and applications before moving onto Section Three which provides an overview of the latest iteration of selection and training for Commando aspirants (the information most people are after) which looks at the various tests that must be successfully completed during, as well as at the end of, the course. The penultimate section looks at the training and units encountered during Commando training and finally Section Five provides some useful information such as useful links and documents. The 1st Commando Regiment, based at Randwick in New South Wales, is the second of three combat capable units within SOCOMD and is an integrated unit composed of regular, ex-regular and reserve soldiers. The 1st Commando Regiment’s primary function is to provide individual commando reinforcements to the Army’s full-time Commando unit, the 2nd Commando Regiment. The 1st Commando Regiment also provides specialist command and control capabilities for Special Operations Command. Raised in 1955, the 1st Commando Regiment has grown from two independent commando companies in Sydney and Melbourne, to raising a commando signals squadron, and finally a Regimental Headquarters in 1981. The Sherwood Green Commando beret is worn as the primary form of head dress, formally recognising Commando qualification. The Sherwood Green beret was adopted due to the close association with the British Army and Marine Commandos of WWII. 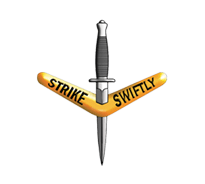 The regimental badge features a silver WWII era Australian fighting knife surmounted by a gold boomerang engraved with the regimental motto ‘Strike Swiftly’. The 2nd Commando Regiment is the third of three combat capable units within SOCOMD. The 2nd Commando Regiment was established on 19 June 2009 when it was renamed from the 4th Battalion, The Royal Australian Regiment (Commando). The 2nd Commando Regiment’s history stems from the decision in 1996 to convert 4 RAR, a light infantry battalion, into a Commando Regiment. On 01 February 1997 4 RAR was renamed as 4 RAR (Cdo) and commenced the development of Australia’s first regular Commando capability. 2nd Commando Regiment’s new regimental badge was created to reflect the history and traditions of Australian Commandos and the offensive nature of the unit. 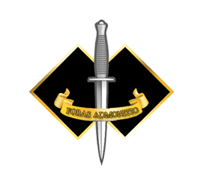 The centre feature of the badge is a silver Fairbairn-Sykes fighting knife, universally recognised as the symbol of a SF unit, and is backed by the blackened double diamonds, representative of the felt colour patches worn on Australian Commando uniforms of WWII. The regiment’s motto is included in a gold scroll ‘Foras Admonitio’, latin for ‘Without Warning’. The motto highlights not only the challenges of modern warfare, but the modus operandi of the 2nd Commando Regiment. In accordance with current Australian Government policy on the employment of women in the ADF, service in the Commandos is open to male and female volunteers. First announced in 2011, women could apply for frontline roles (e.g. Infantry) from 2013, and Commando and SASR roles from October 2015 (Henderson, 2013; Fox, 2015). The aim of Commando training is to prepare ADF personnel for service within one of the two Commando Regiments of SOCOMD by developing the temperament, mental resolve, physical robustness and core military skills necessary in the demanding environment of expeditionary and littoral operations. A sense of humour is the key to Commando training. Candidates are not expected to be superman; they just need the above to pass the course. Like most training courses in the ADF, Commando training has a policy of ‘train in’ rather than ‘select out’. Trained soldier transfers through the in-service transfer scheme. The only method of Direct Enlistment as a Commando in the Australian Army is through the Special Forces Direct Recruitment Scheme (Defence Jobs, 2015). Aspirants will be enlisted in the Infantry Corps. If a candidate is successful as a Special Forces Direct Recruitment Scheme General Entry Commando they will graduate from their Basic Military training, Infantry Initial Employment Training and Commando Initial Employment Training at the rank of private. Civilian entrants must be aged between 18 and 52 years inclusive (prior to August 2015 it was 19 to 30 years inclusive) on the day of enlistment or transfer. Applicants outside of these limits may make an application to the Employment Category Sponsor, Commandant Special Forces Training Centre, for a waiver. It is essential that aspirants have the ability to cope with the intellectual demands placed on them during pre-selection for the Commando Selection and Training Course. This requires aspirants to possess a high level of aptitude. To determine whether aspirants do or do not have the necessary aptitude, they will be required to undertake a series of aptitude tests. Civilian entrants require completion of Australian Year 10 education (or equivalent) with passes in English and Mathematics or aspirants may be eligible to sit an Alternative Education Equivalency (AEE) assessment to ascertain their ability at the required educational level for this trade; view here for further information. Service as a Commando in Australia’s Special Forces is physically and mentally demanding and requires a high level of individual robustness, strength and endurance. Therefore, aspirants must be medically and physically fit and psychologically suitable to undertake SF selection and reinforcement training. Medical: medical fitness will be assessed by a doctor, prior to enlistment. This assessment will require aspirants to complete an extensive questionnaire covering their medical history and it will be followed by a comprehensive physical examination. The above PFA describes the minimum standard for enlistment as a potential Commando candidate. However, a much higher level of physical fitness will be required to successfully complete the Commando Selection and Training Course. The most suitable candidates for Commando training are those who regularly participate in arduous work, team or individual sports, individual or group fitness activities or outdoors adventurous pursuits. Commando aspirants enlisting through the Special Forces Direct Recruitment Scheme as a Commando are required to serve for an initial minimum period of service of four years. However, they are not required to accept this until they have completed their Phase 1 initial training. At this point aspirants are required to accept an initial period of service of four years to be eligible to commence Infantry Phase 2 Initial Employment Training. If an aspirant is unsuccessful in completing their initial training, they can seek ‘discharge at own request’ and are not required to complete the initial minimum period of service. However, if aspirants are unsuccessful at Infantry Initial Employment Training or any subsequent training after that, and choose to withdraw from the Scheme, or if they are found to be unsuitable for service in Special Forces, aspirants will be required to complete their initial minimum period of service within the general Army. In this case, aspirants will also be given the opportunity to be employed as an infantry soldier or in another trade within the general Army. This will be negotiated on a case by case basis. This is designed to ensure the ADF recovers reasonable value from its investment in an individual’s training and development. Applications to resign or transfer to the Reserves from personnel who have not completed their initial minimum period of service will not normally be approved unless compassionate or otherwise compelling personal reasons exist. Serving members of the ADF interested in becoming a qualified-Commando, as a soldier or junior officer, need to be recommended for SF selection by their chain-of-command. Members should also discuss their interest with their respective career agencies prior to applying. For more information about SF selection and training, contact the Special Forces Training Centre, contact details on the Defence Restricted Network (DRN) or through the chain-of-command. Serving members who are interested in joining either of the Commando Regiment’s in a support role should also contact their respective career agencies. In order for trained ADF personnel to be eligible to apply for Commando training they must be qualified up to 343–2 rifleman standard (the 72-day Royal Australian Infantry Rifleman Infantry Operations Basic Course); applicants will not be allowed to undertake the Commando Selection and Training Course until they are qualified Infantrymen. Once the aspirant has begun to undertake training, if they fail any part of the selection course they will be subject to return to unit (RTU) procedure or if from outside of Royal Australian Infantry transferred to one of the battalions of the Royal Australian Regiment (provided Infantry Phase 2 Initial Employment Training has been completed). Reservists will return to their Reserve Units. Figure 1 outlines the current Commando selection and training process as at September 2014. Civilian entrants will be required to complete the standard basic recruit (Phase 1 initial military training) course at the Army Recruit Training Centre, Kapooka, Wagga Wagga, New South Wales. This is a Commando aspirant’s basic military training and all personnel who enlist in the Australian Army are required to successfully complete it. This training will develop in aspirants the necessary skills and qualities to become an Australian Army soldier. It will also provide them with the knowledge and skills they require in order to be able to undertake their Phase 2 initial employment training. On successful completion of Phase 1 initial training and before commencing Infantry Phase 2 initial employment training, aspirants will be required to commit to a four year initial minimum period of service. If during training Commando aspirants are assessed as unsuitable to continue, or are temporarily unsuitable, they will not be permitted to continue with the scheme. In this case aspirants will be encouraged to undertake training for one of the critical support trades within the SF or in the general Army. If aspirants accept either of these options, they will be given another offer or, alternatively, aspirants may elect to ‘discharge at own request’. If aspirants do accept an offer to serve in a critical support trade in SF or the general Army, they can apply again for Commando selection and training after they have completed 24-months of general service in the Army. When aspirants have completed their Phase 1 initial training they will have reached the standard of a basic soldier. Aspirants will have developed the qualities and acquired the attitudes, skills and knowledge (ASK) which is necessary to progress further in the Army. Those Commando aspirants who successfully complete Phase 1 initial training will then attend the standard Royal Australian Infantry Initial Employment Training course delivered by the Australian Army’s School of Infantry located at Lone Pine Barracks, Singleton in New South Wales. Regular Commando aspirants will attend the 72-day Royal Australian Infantry Rifleman Infantry Operations Basic (ECN 343-2) Course. Reserve Commando aspirants will conduct two modules of 16-days each conducted regionally. Module 1 is 16-days of continuous or non-continuous training, including weapon qualifications, equipment, First aid and fitness. Module 2 is 16-days of continuous training in field-craft and field exercises. All aspirants will be trained and qualified in basic infantry tactics and a range of specialist infantry weapons and equipment. Aspirants who are unable to successfully complete their Infantry training will not be permitted to continue with the scheme. In this case they will be encouraged to undertake training for one of the critical support trades within the SF or in the general Army. Aspirants can apply again for Commando selection and training after they have completed 24 months of general service in the Army. Those Commando aspirants who successfully complete Phase 2 initial employment training will attend the 6-week Special Forces Accelerated Infantry Training Programme. This programme is delivered by the Special Forces Training Centre, based at Singleton in New South Wales, and is designed to prepare Commando aspirants for the Special Forces Entry Test and subsequent Commando training, as well as developing their tactical awareness. This accelerated training will enhance an aspirant’s physiological and psychological conditioning and provides an opportunity for aspirants to apply the skills and knowledge developed during Phase1 and 2 training. The programme will also provide aspirants with further training in navigation, communications, first aid, and field-craft, as well as additional skills and knowledge such as instinctive weapon handling. During the programme aspirants will also commence the 15-week Commando Physical Training Package undertaken by SF aspirants already serving in the ADF. Both civilian entrants and in-service transfers are required to attend the 15-week Commando Physical Training Package. To find out if all of the above training has successfully prepared aspirants for the Commando Selection and Training Course they must successfully pass the Special Forces Screen Test. Before commencing the Commando Selection and Training Course aspirants (both civilian entrants and in-service transfers) will be required to show that they are committed, motivated and capable of withstanding the severe physical and environmental stresses associated with the Commando Selection and Training Course. These will be assessed during the Special Forces Screen Test (SFST). There is no minimum standard during the SFST and individual aspirants will be measured against all other aspirants on the SFST. At the conclusion of the SFST, a Selection Advisory Committee will be convened to determine whether aspirants have the potential for service in SF and whether they are suitable to attend the Commando Selection and Training Course. The committee’s determination will be made on an aspirant’s performance at Phase 1 initial training, Phase 2 employment training, and the Accelerated Infantry Training programme and also on their results from the SFST. Aspirants who do not pass the SFST and are not recommended by the Selection Advisory Committee will be encouraged to undertake training for critical support trades within SF or within the general Army. In summary, this phase of an aspirants training will get them to a point where they are assessed as suitable to commence the Commando Selection and Training Course. It will take aspirants at least 27-weeks to reach this point, depending on the length of their initial training. Having mastered basic Infantry skills during both Infantry training courses, the 6-week challenging and arduous Commando Selection and Training Course is designed, as its name suggests, as both a selection and training course. A large part of this course is focused on the employment of the Commando in the field operational environment. Therefore, much of the course is conducted in the field. The course also requires Commando aspirants to participate in live-fire, field firing activities, conducted by night and day, using live ammunition, and a range of supporting weapons. At the completion of this training, aspirants should be proficient in the basic Commando tactics at the team and platoon level, by day and by night, in the field operational environment. Throughout this training aspirants’ will be assessed at the same standard as the other lateral in-service transfers wishing to serve as a Commando. On successful completion of the Commando Selection and Training Course aspirants will commence Commando Initial Employment Training. Special Forces Weapons Course, including heavy weapons (3-weeks): the Heavy Weapons element of the course is designed to train and qualify Commando personnel in a suite of large calibre tripod and vehicle-mounted heavy machine guns that are integral weapon systems to the Commando Unit. Advanced Close Quarter Battle Course (4-weeks); this course is designed to train and qualify personnel in the employment of Commando individual weapon systems, and Commando team, section, and platoon tactics, techniques and procedures (TTPs) in an urban environment. Special Forces Basic Parachute Course, including water insertion (3-weeks); this course is designed to qualify personnel as a paratrooper. It consists of two components. The first component is the standard basic parachute course that trains personnel to conduct parachute descents onto land, by day or night, carrying combat equipment. The second component trains and qualifies personnel to conduct parachute descents into water, by day or night, again carrying combat equipment, as part of a special operations amphibious activity. This is why personnel are asked if they are a volunteer for parachuting. If personnel enjoy this course, there are advanced parachute courses that involve jumping from higher altitudes and using advanced parachutes. These are available to personnel later in their career as a commando. Commando Amphibious Operators Course (3-weeks); this course is designed to train and qualify Commando personnel in the TTPs required for the conduct of amphibious operations. As Commando amphibious operations require personnel to operate in the ocean, sometimes over deep water, a considerable distance from the shore in small boats, and in some cases, in the surf zone, proficiency at amphibious operations is essential for all Commandos. Therefore, this course focuses on developing survivability in the amphibious environment by training personnel in maritime safety and the operation of all marine safety equipment. It also teaches assault swimming techniques (i.e. swimming with weapons and equipment). In addition, personnel will be trained in amphibious insertion and extraction methods, coastal navigation, and the operation and maintenance of the F470 Zodiac, which is a small inflatable boat. Commando amphibious operations are one of the key reasons that it is essential that personnel are a proficient swimmer. Special Forces Signals Course (3-weeks); communications are essential to Commando operations and, as a result, this course is designed to train personnel to operate secure tactical and operational radio-telephone communications equipment, integral to Special Forces. Special Forces Military Roping Course (2-weeks); as a Commando, personnel will be required to operate in a range of environments, including the requirement to operate in the vertical environment. This is true in both the field environment, such as cliffs, and in the urban environment including high-rise buildings. Therefore, this course trains personnel in the TTPs for negotiating vertical obstacles, both ascending and descending, in the field and urban operational environments. It also trains personnel in the TTPs for equipment haulage, and self and other person rescue. This course can also include training in airborne roping techniques depending on the availability of rotary wing aircraft, or this can be completed separately. Therefore, if personnel are thinking of applying for Commando they should not be afraid of working at height. ADF Reserve Commando aspirants are subject to the same selection and training regime as their Regular ADF counterparts. On successful completion of their Commando Initial Employment Training aspirants will normally be posted to 2nd Commando Regiment and be recognised as a qualified Commando Grade One. As of September 2014, total pay (60%) and allowances (40%; Service Allowance, Special Forces Disability Allowance and Uniform Allowance) at this stage gives a total salary of $3,987 per fortnight ($103,944 per year), although this does not include compulsory deductions for taxation, meals, accommodation, utilities (as applicable) or superannuation. Information on the Army Recruit Training Centre and the training syllabus can be found here. The Australian Army’s School of Infantry is located at Lone Pine Barracks, Singleton in NSW, and is commanded by a Lieutenant Colonel (OF-4). During this period of training Commando aspirants will be trained and qualified in Infantry tactics, Infantry weapons and Infantry equipment. Service with the Australian Commandos is open to all male officers and other ranks of the ADF, and females from January 2016. Commando units seek to attract determined, highly-motivated, intelligent, reliable and physically fit individuals to serve with Commando forces. This article provides the basic information to allow individuals to make an informed judgement before applying for Commando training. First aired in 2013, Commando is an Australian documentary that follows a small group of ordinary Australians who take part in one of the toughest military selection course’s in the world. A physically, and psychologically gruelling 6 weeks, designed to identify potential candidates for the 1st and 2nd Commando Regiments. Davies, A., Jennings, P. & Schreer, B. (2014) A Versatile Force: The Future of Australia’s Special Operations Capability. Barton ACT, Australia: Australian Strategic Policy Institute. Defence Jobs (2015) Commando Entry: Other Ranks (Non Technical). Available from World Wide Web: http://www.defencejobs.gov.au/army/jobs/Commando/Entry/. [Accessed: 05 August, 2014]. I was just wondering if you made the Training pipeline yourself or did that come from the ADF? I have recently been in contact with them and was told total training time was 2.3 years for SFDRS which is longer than shown here, with advance infantry being 13 weeks. Have you seen a more updated version of the pipeline? The information contained within this article was obtained from publicly available information (e.g. ADF website, military journals etc.) and was correct at the time of initial publication. Military organisations periodically update/redesign their training programmes/curriculum’s and consequently information may become outdated. We endeavour to periodically update articles to reflect these changes. One should also note there will be time off for leave and there may also be ‘gaps’ between courses, i.e. there may be a period of days/weeks/months between one course and another. Some candidates may require more than one attempt, which will also extend training time. At least that was my experience, even though my fam has over 5 generations of combat army veterans, two having been in spec ops! Doesn’t matter, it’s all about your accomplishments and failures. But nonetheless, detailed article!! Hey mate, what’s are the types of people they are taking from the direct entry scheme and roughly how long does it take ? 1. Types of people: There is no specific person the Commando’s are looking for. Some backgrounds may help more than others but all are assessed on physical, medical and psychological elements. Why would your background help make you a ‘good’ fit for the Commando’s, what you would bring to the role and why do you want to do it, and so on. 2. How Long: Generally, the recruitment process will take a few months depending on vacancies within a role, start date of initial training, how long it takes to do the elements in point 1 above, and so on. I was just curious to know the age of the youngest person to successfully complete commando training. I don’t have an exact answer for your question. However, due to the age restriction (must be 18 or older) and the duration of training, the youngest (theoretically) would be around 19.5 years. I’m really interested to find out the age of the oldest recruit to of got through Commando selection? I don’t have the answer regarding Australian Commandos. However, in 2003, at the age of 55, Captain Norman Fox became the oldest person to successfully complete the British All Arms Commando Course. Norman had previously completed 30 years in the Parachute Regiment. Norman completed the Reserve version of the course, the RFCC. Thank you so much for creating this. I just have a few questions if thats alright, thanks. 1.what are the differences between the sasr and the commandos? 2. can you join the commandos and then join SASR? Thank you. 1. In times of armed conflict and war SASR personnel are required to operate in small parties (4-8 personnel) in enemy controlled territory. In contrast, Commandos may work in support of SASR or act as spearhead troops (generally at the Regimental/Company-level). SASR personnel are expected to work on an individual basis (tested in SASR Selection Course) whilst Commandos will generally work at the Section/Troop-level (tested in the Commando Selection & Training Course). If one wish to also become a parachute jump instructor , what would the prerequisites be ?Thankyou. Sorry, Don’t have an answer for that one. The age limit of 30 doesn’t appear to be accurate, it says 17 to 55 on the official job page for Commando on the defence forces website. First, thanks for letting me know. The age eligibility was 19 to 30, but has obviously changed since May 2015 (when the this page was last updated).